AFSNIT 107-2-01 The standard to which plugs and receptacles of the Danish configuration (DE1-10P and DE1-10R respectively) must be manufactured. ANSI American National Standards Institute (ANSI) is a standards setting agency for the United States. AS / NZS 3112 1993 The standard to which plugs and receptacles of the Australian configurations (AU1-10P, AU2-15P and AU1-10R, AU2-15R respectively) must be manufactured. ASTA ASTA is a certification agency for the United Kingdom. AWG American Wire Gauge. The standard system for designating the physical size of a current carrying wire. BSI British Standards Institution (BSI) is the standards setting and certification agency for the United Kingdom. BS 546A The standard to which plugs and receptacles of the United Kingdom configurations (UK2-15P and UK2-15R, respectively) must be manufactured. Wiring devices of these configurations are generally utilized in countries which were part of the United Kingdom when electricity was introduced into the country, i.e. South Africa and India. BS 1363A The standard to which plugs and receptacles of the United Kingdom configuration (UK1-13P and UK1-13R respectively) must be manufactured. All plugs, rewireable and those molded on to power cords, must be equipped with an internal fuse. Fuses are available in 3, 5, 10 and 13 ampere ratings. The rating of the plug is, therefore, contingent upon the rating of the fuse which is installed into it. C22.2, No. 42 The standard to which plugs and receptacles of Canada configuration (NEMA 5-15P and NEMA 5-15R respectively) must be manufactured. This configuration is the same as the plug and receptacle configuration which is utilized in the United States. Cable A group of insulated conductors twisted together and contained within an overall insulating jacket. CEBEC Comite Electrotechnique Belge (CEBEC) is the certification agency for Belgium. CEE 7 The standard to which grounded plugs and receptacles of the Germany configuration must be manufactured. This configuration is commonly referred to as the SCHUKO configuration and is utilized throughout most of the continental Europe. CEE 7-7 The standard to which grounded plugs and receptacles of the Germany configuration (EU1-16P and EU1-16R respectively) must be manufactured. Plugs that are manufactured to this standard have a slot in the face which allows the plug to mate with French and Belgian receptacles (FR1-16R). This configuration is commonly referred to as the “SCHUKO” configuration and is utilized throughout most of the continental Europe. CEE 7-16 The standard to which non-grounded plugs and receptacles of the Germany configuration must be manufactured. The plug is commonly utilized throughout the continental Europe and is therefore often referred to as the ”Europlug”. CEI Comitato Elettrotecnico Italiano (CEI) is the standards setting agency for Italy. CEI 23-16/VII The standard to which plugs and receptacles of the Italian configurations (IT1-10P, IT2-16P and IT1-10R, IT2-16R respectively) must be manufactured. CENELEC European Committee for Electrotechnical Standardization (CENLEC) is a standards setting agency which is responsible for developing electrical standards that are universally acceptable to all CENELEC member nations. Austria, Belgium, Denmark, France, Federal Republic of Germany, Finland, Greece, Ireland, Italy, Netherlands, Norway, Portugal, Spain, Sweden, Switzerland and the United Kingdom are members of CENELEC. CSA Canadian Standards Association (CSA) is the standards setting and certification agency for Canada. CSBS China State Bureau for Standardization (CSBS) is the standards setting agency for the People’s Republic of China. DEMKO Dansk Elektroteknisk Komite (DEMKO) is the certification agency for Denmark. DIN Deutsches Institut fur Normung (DIN) is the standards setting agency for Germany. Europlug Plug manufactured to the German standard CEE7-16. The plug is commonly utilized throughout the continental Europe and is therefore often referred to as the ”Europlug”. Filler A nonconducting material used in multiconductor cables to occupy the voids formed by the cabled conductors. FIMKO FIMKO Limited (FIMKO) is the certification agency for Finland. GB 1002-1996 & GB 2099.1-1996 The standard to which plugs and receptacles of the Chinese configurations (CH1-10P, CH2-16P and CH1-10R, CH2-16R respectively) must be manufactured. Gost 7396 The standard to which plugs and receptacles of the Russian configuration must be manufactured. The plug is similar to the German Schuko plug except the plug pins are 4.0 mm in diameter. Harmonized Cordage Cordage that is manufactured in accordance with CENELEC’s Harmonization Documents HD-21 or HD-22. In order to identify a harmonized wire or cable, one of the following identification methods are required; (1) Printed letters (HAR) on either the overall jacket or insulation or (2) Printed tape or identification threads. HD-21 CENELEC’s Harmonization Document HD-21 provides the specifications for polyvinyl chloride (PVC) insulated wire and cable. HD-22 CENELEC’s Harmonization Document HD-22 provides the specifications for rubber insulated flexible cords and cables. IEC International Electrotechnical Commision is an international committee that developes and publishes its recommendations for standardising international wiring devices and products. IEC 60309 (Formerly IEC 309 - CEE 17) International Electrotechnical Commision standard that applies to a series of heavy duty plugs and receptacles of a pin and sleeve design and that have a specific ampere/voltage rating for each individual configuration. 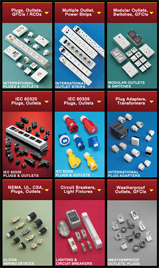 IEC 60320 (Formerly IEC 320) International Electrotechnical Commision standard that applies to a series of plugs, connectors, inlets and outlets designed for use on portable equipment such as computers, printers, medical equipment and other electrical or electronic equipment. IMQ Instituto Italiano del Marchio di Qualita (IMQ) is the certification agency for Italy. IP Ingress Protection (IP) - grades of protection against external solids contacting the conductors of a wiring device and against the penetration of liquids into the wiring device as per the standard established by International Electrotechnical Commision (IEC). IP 44 or IP X4 Ingress protection is provided against solid bodies of dimensions above 1 mm diameter and against sprinklings of water. These devices are typically considered to be “splashproof”. IP 67 or IP X7 Ingress protection is provided against dust and against immersion under predetermined pressure and time conditions. These devices are typically considered to be “watertight”. Insulation A material having a high resistance to the flow of electrical current. Used to isolate conductors. IRAM Instituto Argentino de Racionalization de Materiales (IRAM) is the standards setting agency for Argentina. IRAM 2073 & IRAM 2063 The standard to which plugs and receptacles of the Argentinian configuration (AR1-10P and AR1-10R respectively) must be manufactured. Jacket The outer covering of a cable which provides protection against the environment. JET Japan Electrical Testing Laboratory (JET) is the testing agency for Japan. JIS 8303 The standard to which grounded plugs and receptacles of the Japanese configuration (JA1-15P and JA1-15R respectively) must be manufactured. KEMA NV tot Keuring van Elektrotechnische Materialen (KEMA) is the certification agency for the Netherlands. LCIE Laboratoire Central des industries electriques (LCIE) is the certification agency for France. MITI The Ministry of International Trade and Industry (MITI) is the organization to which all testing and/or approval agencies in Japan belong. Dentori and JIS approvals are administered by MITI. NEMA National Electrical Manufactures Association (NEMA) is a standards setting agency for the United States. NEMA 5-15 The standard to which 15 ampere 125 volt grounded straight blade plugs and their corresponding receptacles of the North American configuration (NEMA 5-15P and NEMA 5-15R respectively) must be manufactured. NEMA 5-20 The standard to which 20 ampere 125 volt grounded straight blade plugs and their corresponding receptacles of the North American configuration (NEMA 5-20P and NEMA 5-20R respectively) must be manufactured. NEMA 6-15 The standard to which 15 ampere 250 volt grounded straight blade plugs and their corresponding receptacles of the North American configuration (NEMA 6-15P and NEMA 6-15R respectively) must be manufactured. NEMA 6-20 The standard to which 20 ampere 250 volt grounded straight blade plugs and their corresponding receptacles of the North American configuration (NEMA 6-20P and NEMA 6-20R respectively) must be manufactured. NEMA L5-15 The standard to which 15 ampere 125 volt grounded locking plugs and their corresponding receptacles of the North American configuration (NEMA L5-15P and NEMA L5-15R respectively) must be manufactured. These wiring devices have a locking feature that is designed to prevent accidental disconnects. NEMA L5-20 The standard to which 20 ampere 125 volt grounded locking plugs and their corresponding receptacles of the North American configuration (NEMA L5-20P and NEMA L5-20R respectively) must be manufactured. These wiring devices have a locking feature that is designed to prevent accidental disconnects. NEMA L5-30 The standard to which 30 ampere 125 volt grounded locking plugs and their corresponding receptacles of the North American configuration (NEMA L5-30P and NEMA L5-30R respectively) must be manufactured. These wiring devices have a locking feature that is designed to prevent accidental disconnects. NEMA L6-15 The standard to which 15 ampere 250 volt grounded locking plugs and their corresponding receptacles of the North American configuration (NEMA L6-15P and NEMA L6-15R respectively) must be manufactured. These wiring devices have a locking feature that is designed to prevent accidental disconnects. NEMA L6-20 The standard to which 20 ampere 250 volt grounded locking plugs and their corresponding receptacles of the North American configuration (NEMA L6-20P and NEMA L6-20R respectively) must be manufactured. These wiring devices have a locking feature that is designed to prevent accidental disconnects. NEMA L6-30 The standard to which 30 ampere 250 volt grounded locking plugs and their corresponding receptacles of the North American configuration (NEMA L6-30P and NEMA L6-30R respectively) must be manufactured. These wiring devices have a locking feature that is designed to prevent accidental disconnects. NEMKO Norges Elektriske Materiellkontroll (NEMKO) is the certification agency for Norway. Neoprene The Dupont trade name for polychloroprene a synthetic rubber which has the characteristics of good resistance to oil, chemical and flame. OVE Osterreichischer Verband Fur Elektrotechnik (OVE) is the certification agency for Austria. PVC Polyvinyl chloride, a thermoplastic material used to insulate conductors and for cable jackets. SAA Standards Association of Australia (SAA) is the standards setting agency for Australia. SABS 164 The standard to which grounded plugs and receptacles of the South African configuration (UK2-15P and UK2-15R respectively) must be manufactured. SANZ Standards Association of New Zealand (SANZ) is the standards setting agency for New Zealand. Schuko Plugs and receptacles of the Germany configuration (EU1-16P and EU1-16R respectively) manufactured to the CEE 7-7 standard. Plugs that are manufactured to this standard have a slot in the face which allows the plug to mate with French and Belgian receptacles (FR1-16R) This configuration is commonly utilized throughout most of the continental Europe. SEMKO Svenska Elektriska Materielkontrollanstalten AB (SEMKO) is the testing and certification agency for Sweden. SEV Schweizerischer Electrotechnischer Verein (SEV) is the certification agency for Switzerland. SEV 1011. 1959 The standard to which grounded plugs and receptacles of the Swiss configuration (SW1-10P and SW1-10R respectively) must be manufactured. SI 32 The standard to which grounded plugs and receptacles of the Israeli configuration (IS1-16P and IS1-16R respectively) must be manufactured. SII Standards Institution of Israel (SII) is the certification agency for Israel. SJT UL cord type designation. Service Junior Thermoplastic jacket used for hard service applications. SJTO UL cord type designation. Service Junior Thermoplastic Oil resistant jacket used for hard service applications. SPT UL cord type designation. Service Parallel Thermoplastic. SVT UL cord type designation. Service Vacuum Thermoplastic jacket not for use in hard service applications. UL Underwriters Laboratories (UL) is a testing agency for the United States. UTE Union Technique de l’Electricite (UTE) is the standards setting agency for France. VDE VDE Pruf und Zertifizierungsinstitut (VDE) is the certification agency for Germany.